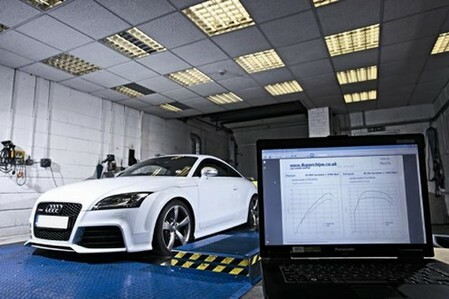 British electronics gurus from Superchips released another amazing package this time for Audi TT-RS. This kit which is plug & go, will instantly increase the power by 65 hp, just through some new mapping. The standard 2.5 liter 5-cylinder turbocharged engine of the TT-RS has 338 hp. So with the new ECU it delivers 401 bhp. That is a lot of power in a car the size of a show! And as for torque, it’s even bigger at 551 Nm. and all this for just 440 Quids. Superchips has not tested the car yet, but they reckon it can do 0 to 60 mph in 4.6 seconds.